Hi! My name is Maggie and I am the Student Government Board President! I am from Malvern, PA (a suburb of Philly), I have an older sister and a younger brother, and I grew up playing soccer and basketball. Besides Student Government, at Pitt, I served as a Resident Assistant during my sophomore and junior years in Holland Hall and Tower A, respectively, I am a member of the Omicron Delta Kappa National Leadership Honor Society, I am a SAFE Peer Educator, and I am a member of The Songburghs A Cappella Group. 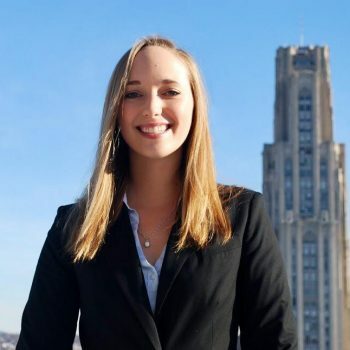 If you ever have any questions or concerns or if you just want to talk, please stop by my office in 848 of the WPU or shoot me an email at sgbpresident@pitt.edu! As always, H2P! Fun Fact: Michelle Obama hugged me once! On Campus I can be found: SGB Office, Music Practice Rooms, or Frick Fine Arts Library!